“In the 1990s, the small country of Malawi in south-eastern Africa was facing severe economic problems after enduring one of the worst HIV-AIDS epidemics in the world and surviving a horrific dictatorship. They had to ask the IMF for help. The IMF said they would only give assistance if Malawi agreed to the ‘structural adjustments’ the IMF demanded. They ordered Malawi to sell off almost everything the state owned to private companies and speculators, and to slash spending on the population. They demanded they stop subsidising fertilizer, even though it was the only thing that made it possible for farmers – most of the population – to grow anything in the country’s feeble and depleted soil. They told them to prioritise giving money to international bankers over giving money to the Malawian people. 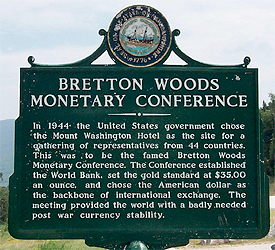 The World Bank was born along with the IMF at the 1944 Bretton Woods conference that decided on the financial architecture of the post-WWII world, only at that time it was known as the “International Bank for Reconstruction and Development” and was concerned primarily with post-war reconstruction of Europe. After the implementation of the Marshall Plan in 1947, however, its focus shifted to the non-European world where it provided development loans targeted at helping developing countries create income-generating infrastructure (power plants, seaports, highways, etc.). From the very beginning there have been questions about the overlap of the IMF and World Bank’s respective roles. Both are committed, according to the IMF website, to “raising living standards in their member countries,” but the IMF is financial in nature, concentrating on short and medium-term loans to help countries meet balance of payment needs , while the World Bank is fundamentally a development institution, focusing on technical and financial support for specific projects or sectoral reforms. Part of the confusion is linguistic; at the first ever meeting meeting of the IMF the “father” of Bretton Woods, John Maynard Keynes (who else? ), confessed he thought the Fund should be called a bank and the Bank should be called a fund. Nevertheless, the monikers have stuck and the World Bank and IMF continue to talk the talk of global infrastructure development and poverty reduction. Since the World Bank pivoted away from Europe to concentrate on the developing world in the late 1940s, it has lent more than $330 billion on infrastructure development projects. It currently boasts $232.8 billion in total subscribed capital, overseeing $358.9 billion in total assets. The World Bank concentrates its lending on creditworthy governments of developing nations, and splits its lending activities between the International Bank for Reconstruction and Development (IBRD) and the International Development Association (IDA). The IBRD generally provides 12-15 year loans at slightly above market rates to countries with per capita GDPs above $1305. The IDA, meanwhile, provides interest-free 35 to 40 year loans to countries with per capita GDPs below the $1305 mark. Unlike the IMF, which is funded by quota subscriptions from member countries, the World Bank finances its lending by borrowing on the international bond market. As a result, for the first decades of its existence the World Bank was concerned with building up its reputation as a lender and establishing its own creditworthiness. Until 1968, the Bank was a relatively small institution with less than 1000 employees concentrated in Washington that concerned itself almost exclusively with loans designed to finance transportation and energy infrastructure projects. 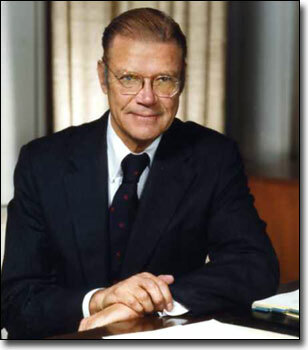 When JFK/LBJ Secretary of Defense and unconvicted war criminal Robert McNamara took over as president in 1968, however, he began a radical repositioning of the Bank and transformation of its aim, scope and practices. Over his 12 years at the helm of the Bank, McNamara greatly expanded its lending activities, shifting the aim of that lending toward agricultural reform and literacy initiatives, as well as the building of schools and hospitals. During this period the Bank’s treasurer, Eugene Rotberg, increased the Bank’s capital by going beyond the established developed world banks that had been its primary funding source and tapping into the global bond market. In the 1980s the bank began to press so-called “Structural Adjustment Programs” on loan recipients, including mandates to devalue currencies or reduce government spending in various areas, as pre-conditions for lending. The Bank also began providing lending to help governments service the debts they had racked up in previous rounds of lending. After the Bank came under increasing scrutiny (and protest) in the 1990s and early 2000s, it has adjusted its policies and practices to address its critics. It now touts environmental responsibility in the infrastructure projects it provides loans for and places greater emphasis on the goal of promoting economic engagement by the poorest people in its target countries. As a result, the World Bank now claims to focus on the eradication of hunger, gender equality, environmental sustainability, maternal health and child mortality, communicable disease prevention, and universal primary education in its target countries. As readers of these pages will no doubt be aware, there is of course more to the story than that glossy, PR-friendly official story would have us believe. The period of McNamara’s stewardship from 1968-1980 was instrumental in shaping the institution that we know (or should know) today: a tool of the Washington power players that is used as a way of transferring the productive wealth of the third world back to the first world. The larger capital that was raised during his tenure was used to expand the bank’s lending activities, and those expanded loans kicked off the era of the third world debt crisis, including a period from 1976 to 1980 where developing world debt rose on average 20% per year. The process by which these loans are made and the funds distributed to their recipients has long been rife with waste, corruption and fraud. Even in the best circumstances, the types of projects that the Bank concerned itself with in its early days, infrastructure projects focusing on energy and transportation, served to primarily enrich those who were already the richest in the target countries, the friends and cronies of the corrupt rulers whose business interests could make use of such innovations. At its worst, the Bank has been used to underpin the rule of corrupt and tyrannical leaders and force entire nations into debt slavery. This process was described most famously by former insider and self-described “economic hitman” John Perkins, who wrote his “Confessions of an Economic Hitman” to shed light on the means by which the seemingly benevolent IMF/World Bank system is used to oppress and plunder the very populations it is designed to enrich. “So how does the system work? We economic hitmen have many vehicles to make this happen, but perhaps the most common one is that we will identify a country-usually a developing country-that has resources our corporations covet, like oil, and then we arrange a huge loan to that country from the World Bank or one of its sister organizations. “Now most everybody in our country believes that loan is going to help poor people. It isn’t. Most of the money never goes to the country. In fact it goes to our own corporations. It goes to the Bechtels and the Halliburtons and the ones we all hear about, usually led by engineering firms, but a lot of other companies are brought in and they make fortunes off building the infrastructure projects in that country. Power plants, industrial parks, ports, those types of things. Things that don’t benefit the poor people at all; they’re not connected to the electrical grid, they don’t get the jobs in the industrial parks because they’re not educated enough. But they as a class are left holding a huge debt. The country goes deep into debt in order to make this happen, and a few of its wealthy people get very rich in the process. They own the big industries that do benefit from the ports and the highways and the industrial parks and the electricity. In his book, “The Globalization of Poverty and the New World Order,” Professor Michel Chossudovsky of the University of Ottawa provides extensive documentation of precisely how this process has functioned over the years through the Structural Adjustment Loan and Sector Adjustment Loan programs at the World Bank’s disposal. This documentation includes details of the Bank’s oversight of the build-up of Rwanda’s military budget in the run-up to its bloody internal war of 1994, the Bank’s own admission of how its loan-dictated deregulation of Vietnam’s grain market led to widespread child malnutrition in the country, and the World Bank’s contribution (in conjunction with the IMF) to the unprecedented plundering of Russia that took place in the wake of the Soviet collapse. The World Bank, despite its friendly exterior and the lofty platitudes its proponents spout in its defense, continues to undergird a system of exploitation and debt enslavement of developing countries. For half a century, the Bank has been responsible for the furtherance of a Pax Americana built not upon peace, prosperity and free trade but violence, debt and enforced servitude. 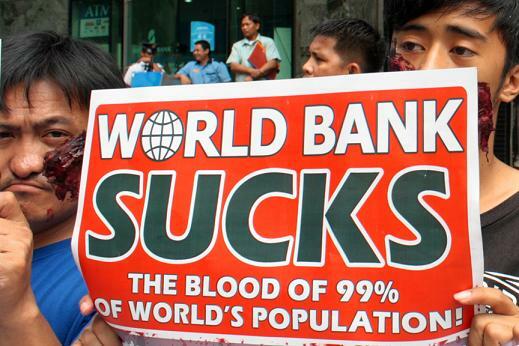 …But now along comes the New Development Bank promising an alternative to the World Bank hegemony. Unlike the Structural Adjustment Loan regime of the World Bank, the NDB is promising to provide loans with no strings attached; the BRICS have no interest in telling loan recipients how to run their country. Is this a fundamental challenge to the system as it exists? Is the NDB likely to live up to the lofty expectations that have been placed on it? In what time frame can we expect to see the changes to the international order take place? The answer to these questions constitute what Paul Harvey would call in his trademark drawl, “the rest of the story…” and we will explore that story here next week.